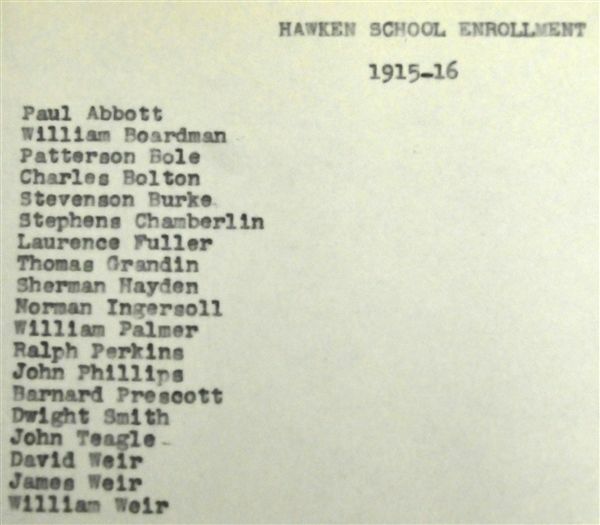 When Hawken School opened its doors in 1915, World War I (“the war to end all wars”) was raging in Europe; America declared war on Germany in April of 1917. The Suffrage Movement was in full swing: In 1915, 25,000 women marched up Fifth Avenue in New York City demanding the right to vote, and in 1919 the 18th Amendment was passed. The 19th Amendment (Prohibition) was also passed in 1919. The world’s population was 1.8 billion, life expectancy at birth was 48 for males and 51 for females, and the influenza epidemic (Spanish Flu) caused 40 million deaths worldwide. The average annual income during these years was about $750. The percentage of women in the workforce age 10 and over was 21.5%, and only 13.5% of the population earned high school diplomas. Cleveland ranked #6 of top 10 largest urban places (behind NY, Chicago, Philadelphia, and St. Louis and Boston). Model T Fords became more affordable with mass production; silent movies and ballroom dancing were the rage. (The Tango, however, was banned in Boston, New York, and Cleveland.) Also in this decade, the milk carton was invented and processed cheese was introduced. James Hawken, with the help of his friend Henry Sheffield, found a way to fulfill his dream of founding a such a school, and in October of 1915, Hawken School opened its doors for the first time to 19 boys. Classes were held in three rooms of a converted house at 1572 Ansel Road that overlooked Wade Park, while the upstairs served as living quarters for Hawken and two other original faculty members, William Phelan, who specialized in language studies, and Joe Motto, a talented artist and sculptor. (See photo from Get Ready landing page) The back yard, an area of about fifty square feet, served as the playground. There was no janitor, so the teachers took on maintenance of the facility as well, including snow shoveling, housekeeping, and landscaping duties. Word spread quickly that this school offered something indeed very different and special, and Hawken soon outgrew its limited quarters. Upon Stephens’ arrival just one year after the school’s founding, he noted that “1572 was now the Headmaster’s home and a few doors south at 1588 was the new school, a much larger house and yard. The enrollment was thirty-five and four new masters were added to the faculty.” John Ciarillio, who was to become a beloved fixture at Hawken for the remainder of his life, arrived daily by bicycle to oversee the maintenance of the new building. H. Mortimer Smeed, Mr. Hawken’s nephew, also arrived that same year, ultimately establishing himself as a long-time teacher who was endearingly nicknamed “Toughy.” In its second year Hawken spanned grades one through five, with grades one and two ending at noon and grades three through six extending until late afternoon. Those who lived within a few blocks of schools went home for lunch, while the others spent the lunch hour walking with masters to the tea room at the Cleveland Art Museum. The additional space at this new facility included a kitchen that served as Mr. Motto’s clay modeling studio and a barn that was used for drama, manual training, chapel, and athletics. It was in that barn where chapel services featured talks by the boys, where the first Christmas play was performed, and where the basketball team practiced for its first interscholastic game, which they lost by a score of 50 to 0. April 1917 marked America’s entry into World War I and the subsequent depletion of the faculty that James Hawken had worked so hard to recruit and train under his “every master a headmaster” philosophy. Those who went off to war were replaced by an entirely new staff when the then first through sixth grade school opened in 1918, including the legendary Fannie Luehrs, John Carney, and Ross MacMahon joining the staff. After the war, Stephens, Smeed, and Phelan were happily welcomed back to the faculty by Jim Hawken, who knew better than to let a good teacher get away. Enrollment continued to climb at 1588 Ansel Road as a seventh grade was added and additional teachers hired. By 1919, the school added an eighth grade, which occupied the third floor attic area of the house. 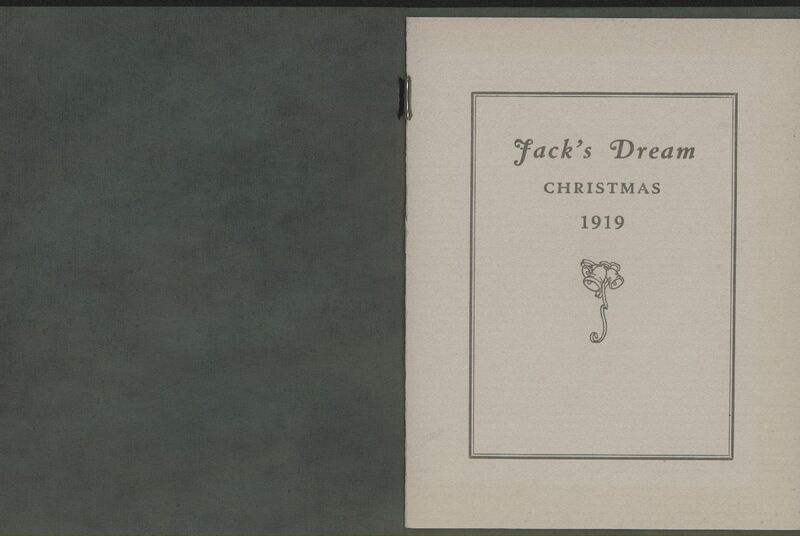 By the end of the decade, plans were already underway to build a new school in rural Lyndhurst to accommodate the growing enrollment and to keep the boys safe from the increasing perils of automobile traffic on Ansel Road, which had already tragically taken the life of 9 year old Myron Herrick in 1917 when he ran into the road. In those early years, two major elements kept Hawken anchored in the face of these formidable challenges: James A. Hawken’s extraordinary vision and unwavering principles, and the remarkable generosity of several early benefactors who ardently believed in that vision. 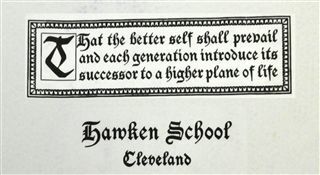 Because Hawken School’s original five families were not interested in financing the school, it fell on James Hawken to acquire the necessary funding. Being a man of limited financial means, he sought support from his friend Henry Sheffield, a wealthy and prominent Cleveland attorney who believed in Hawken and his friend’s vision for the school. James Hawken later acknowledged that without Sheffield’s financial support in those early years on Ansel Road, there would have been no school. Throughout the years, Sheffield continued to provide support for the school, as did Hawken himself, who preferred to reduce his own salary rather than compromise educational quality. 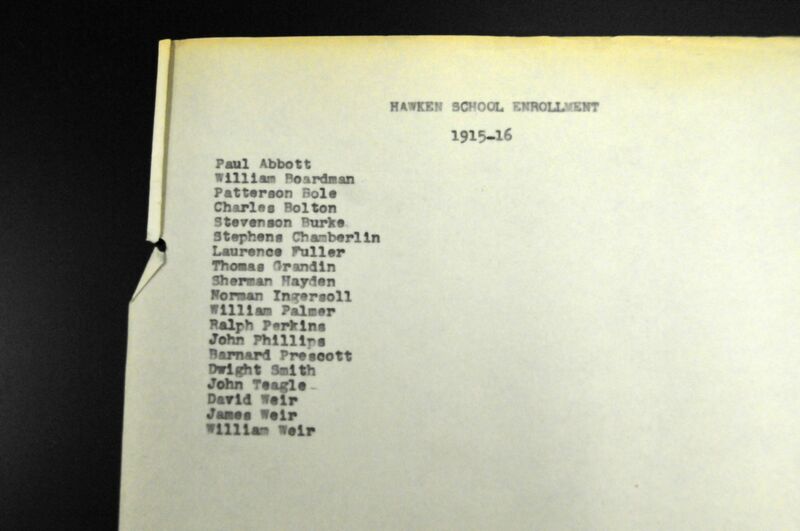 Overseeing the quality of education was so important to James Hawken that he was known to turn down gifts that could potentially lead to a loss of control of educational policy. Another of the school’s earliest benefactors, Francis Payne Bolton, addressed this dilemma by joining with Roberta Holden Bole to establish the Hawken School Endowment Association in 1919, which could receive gifts for the school but had no voice in school policy. The Association’s first members included Frances and Chester Bolton, Roberta Bole, Warren Hayden, and Henry Sheffield. The first gift received was 14 acres of farmland in Lyndhurst from Frances and Chester Bolton. With that gift came the promise of funding for a new building to come several years later. 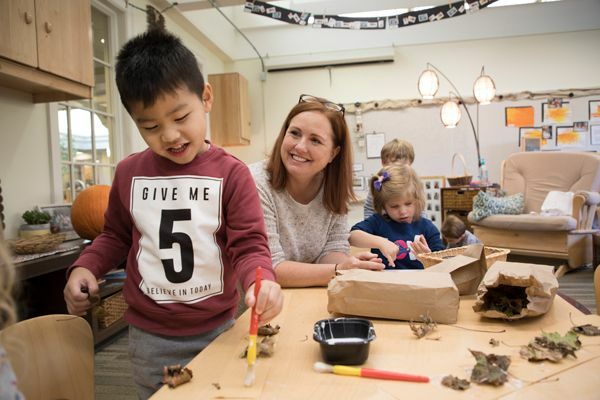 Without the major financial support of Frances Bolton from the school’s beginnings until her death in 1977, Hawken School would not be what it is today. (Read more about Frances Payne Bolton’s remarkable life of public service and her contributions to Hawken.) – link to In Memoriam tribute by Stenberg in Hawken Review 1977; http://fpb.case.edu/visitors/boltonact.shtm; http://history.house.gov/People/Detail/9566; http://www.thirteen.org/fpb/spiritual.html. Hawken’s spirituality and religious background are reflected in his emphasis on character, discipline, and duty. A former seminarian, Hawken wrote, “We hope that our boys will have some spiritual qualities, but we mean that he shall know how to read and write and figure. My whole point is that these spiritual qualities (initiative, sincerity, truthfulness, courage, thoroughness, reverence, etc.) are infinitely more important to his present charm and future achievement than the most complete knowledge of writing arithmetic, history, grammar, classics, and natural science.” Hawken believed that learning should extend beyond one’s self and the classroom. In 1918 he organized the Cleveland chapter of the Junior Red Cross, enlisting students from all Cleveland schools in the war effort. By supplying necessities for soldiers, students were given an opportunity to fulfill their civic duty.